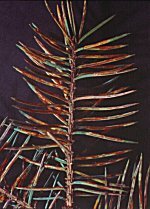 Symptoms Youngest needles in summer with one to several yellow cross bands; in these bands dark orange-red cushions or longitudinal stripes (spore bearing structures), which – by contrast to the alpine spruce needle rust (Chrysomyxa rhododendri) never produce spore dust; loss of needles. Impact In early summer commonly following extensive rainfall or on sites with high humidity. 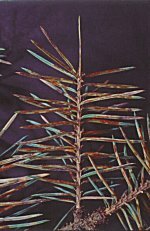 Especially in Christmas tree plantations this rust may cause heavy losses of needles lowering the value of the trees; however, the disease is never endangering the life of a tree. 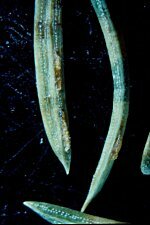 Further information (in German): Gehölzkrankheiten in Wort und Bild (TUM Weihenstephan). Control Fungicides controlling rusts only in commercial plant production (see official register of Plant Protection) and only in heavily infested stands. The shown graphical material is copyrighted. © 2006 BFW Wien. You can use the images for your own publications only if you name the source AND if you have a valid agreement with BFW Vienna. Furthermore images in high resolution are for sale at BFW. In this case please contact (Department of Forest Protection) or , our PR manager.